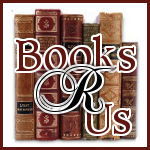 Do you love reading? Well, what better way to read than IN COLOR! You can surf the web, send and receive email and listen to music. With so many Apps to choose from, you will find something that interests you. 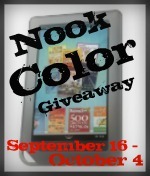 I have joined up with the fabulous bloggers listed below to bring you this amazing change to win a NOOK COLOR! So, how do you win this fabulous prize? Simple! Just fill out the Rafflecopter form below! You MUST complete the mandatory entry of liking all the blogs facebook pages! After that, there are lots of additional entry options! REMEMBER, the more entries you do, the better your chances of winning! Are you imagining yourself sitting out on the porch reading your favorite novel or surfing the web in COLOR yet? Sure you are! So go ahead, get your entries in and the winner just might be you! GIVEAWAY ENDS ON OCTOBER 10TH AT 11:59 PM!